Saint Philip Preschool is a large, open classroom with ten learning centers. 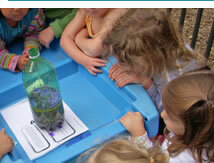 Each center provides opportunities for exploration and hands on learning. Children choosing among a number of child and teacher directed activities work at their own pace, practice fine motor skills and develop creativity. Playing in small groups, they practice communication skills, develop empathy and learn how to resolve conflicts. These foundational social skills will continue to be built upon as children grow and continue on their educational paths. Our outdoor area provides room to practice gross motor skills, connect with nature and have fun. Children are encouraged to explore the environment, play in small and large groups, participate in organized activities and enjoy uninterupted free play.